If you're an East Lothian teacher wanting to use ICT creatively, say for an Extreme Learning project, Emma Griffiths may be able to help. More details on this page of the project wiki. "My role in East Lothian ... is to support teachers who are using ICT creatively. I am on a one day a week secondment from my primary teaching post. I would like to make personal visits, and I am flexible, but there are lots of you, and one of me, for one day a week." No, not the weblog of a new parent. This one's from the Mum of a Ross High student, and it's at http://exc-el.org.uk/blogs/guineapigmum. "Must confess to finding the site whilst writing a letter of complaint to the school (more about that later) and it set me thinking that teachers must feel that they only ever hear from parents when things go wrong. So this I hope is an opportunity to talk about the things going right from my viewpoint - as well as the odd problem of course." It looks like this one's going to be essential reading. Why not pop along and say hello? 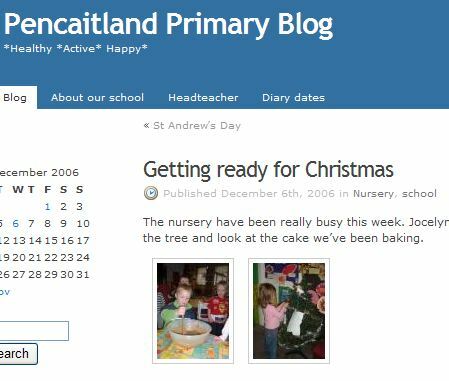 Now that the Exc-el Edublog service is up and running, it's available for all East Lothian learners, including for class and student blogging. The photos in the banner show the first student blogs being posted on the last day before the break. We're deliberately not publicising them, though, until all the students have got their blogs looking the way they want! If you're thinking of giving it a try, please check first of all that the PCs you plan to use have got Microsoft Internet Explorer Version 6 installed. Most have, but there are still some around on Version 5.5, and it doesn't allow WordPress to work properly. Just start Internet Explorer, then click Help, then , from the drop-down menu, choose About Internet Explorer. If your PC has V5.5, you'll need to contact the helpdesk to arrange an upgrade. Please contact David if you want to find out more.